Please note that for fairness reasons, these deadlines are strict. Please, if possible, try to not wait for the last hour since the system may get busy. LaTeX users, please download this file (486 KB). Word users, please download this file (654 KB). Important note: Only submissions in PDF format are accepted. 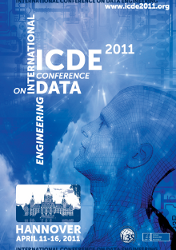 Please submit your paper through the CMT site (https://cmt.research.microsoft.com/ICDE2011/) for ICDE 2011.